Unlike active shutter glasses for 3D HDTVs that are not cross compatible between different brands, the passive 3D glasses used in pretty much any passive 3D HDTV and most passive 3D monitors are all using the same technology (LG Home Cinema or Vizio Home Theater 3D HDTVs for example), and you could even use these in some movie theaters that rely on the same standard (RealD). And with the recent commotion regarding Sony’s plans to stop subsidizing the 3D glasses in movie theaters the idea to buy your own personal 3D glasses is becoming more attractive. And while there are a lot of options for such glasses already available, including quite expensive ones from different designer brands, there are also some brands making nice looking and comfortable glasses that won’t cost you a fortune, like for example Dimensional Optics and their brand new 3Dazzle and 3Razzle product lines. They offer a few different designs and come in four different color flavors: cherry, grape, lemon lime, blue ice. 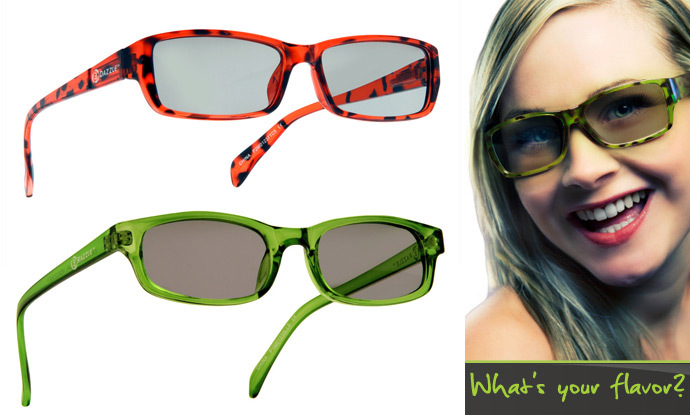 The glasses are available for $19.95 USD and $9.95 USD for the models from the 3Dazzle and 3Razzle product lines respectively. These new 3D glasses come with good quality optics, better than most cheaper passive 3D glasses you get with the purchase of a passive 3D HDTV and offered as an option and even better than the traditional reusable 3D glasses you get in movie theaters. They have a light and comfortable frame that you can wear without any discomfort for longer time and as I already mentioned, they won’t cost you a lot like some very expensive designer models that may look a bit nicer, but probably won’t provide you with a better 3D experience anyway. So do check these out and feel welcome to share your feedback if you already got a pair of them. 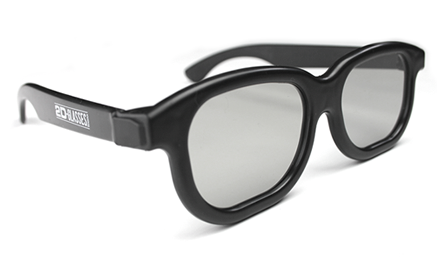 Do you remember the De-3D Cinema Glasses prank that ThinkGeek has pulled for April 1st this year, well the movie theater glasses that will turn a 3D movie into a 2D one are now real and you can buy them for $7.99 USD a pair. But why would you need glasses that make a 3D movie into a 2D one, when you can just go to a projection of that movie in 2D and not pay for a more expensive ticket for 3D projection? The answer is pretty simple, if you are not going alone to the cinema and only you have trouble when watching 3D and your friends still want to watch the movie in 3D, you can be with them and still watch in 2D with the special pair of glasses. The 2D Glasses are intended to be used in movie theaters using RealD projection technology and should be also compatible with most passive 3D television sets. They are not compatible with IMAX 3D movie theaters or ones using Dolby Digital 3D technology as these use different type of glasses, and of course they are not compatible with active shutter glasses solutions. Active shutter glasses such as Nvidia’s 3D Vision can also be modified to show 2D image from a screen displaying a 3D one, I’ve made a guide on how to do that. In late 2010 I wanted to go see Tron Legacy. My wife was happy to come with me… as long as we went to the cheap theater where it was playing in 2D. Really? Tron in 2D? What’s the point right? And then my wife told me something I never knew, she gets bad headaches when watching 3D movies. She never complained about it, but there it was. I didn’t want my wife to be in pain, but I also didn’t want to go see Tron by myself. So instead of complaining (okay, in ADDITION to complaining), I got out my tools. Instead of “recycling” the 3D glasses that my wife and I used during the movie, I took them home. After a lot of poking and twisting and gluing and cutting and cursing and sawing, I had created my first pair of 2D Glasses. They’re not pretty, but I took them to see Voyage of the Dawn Treader in 3D and they worked! Katherine could watch the movie in 2D, and even switch to 3D for the action scenes! She told some friends and by the next week, I had around 10 “orders” for these ugly 2D glasses. Stealing my raw materials from the theater became impractical, so I decided to get some nice ones made and make them available to the world. What these 2D glasses actually do is to use two lenses with the same light polarization, instead of lenses with different polarization for the left and right eye as the typical passive polarized 3D glasses do. So basically in order to make a pair of 3D glasses into a one showing you 2D image from a 3D projection you just need to replace the right lens on the glasses with another left one. So instead of getting two slightly different images through each of your eyes and the brain fusing them into a 3D image with these glasses both your eyes will see only the left projected frame and it will still feel as a 2D image. And there goes the trouble and problem you may be experiencing watching 3D content, even though the projection would still be in 3D, you will be seeing a 2D movie with these modified glasses.